What if a trade deal died and nobody noticed? The presidential campaign trail has been awash in angry backlash against the Trans-Pacific Partnership (TPP), the latest in a slew of controversial free-trade deals that symbolize to American voters the evils of corporate globalization. But another trade deal collapsed silently on the other side of the globe. The Transatlantic Trade and Investment Partnership (TTIP) was supposed to be the Atlantic world’s analog to the TPP, but after three years of frustrated negotiations, it was just pronounced dead by key ministers, or at least temporarily moribund, overwhelmed by a phalanx of populist opposition across the continent. How’d that happen? It could be that corporate lobbyists and ministers are just hoping for a more opportune political climate, but the demise of this version of TTIP illustrates that, in real-life political terms, trade deals could mostly prove useless at best for trade and devastating at worst for democracy. TTIP, perhaps more than previous global trade pacts, was aimed at “harmonizing” corporate governance between the economies of wealthy trade partners. The deal, which was renamed a “partnership” instead of the more NAFTA-esque original title, Trans-Atlantic Free Trade Agreement, would impose uniform rules to facilitate capital flow, not so much by changing trade policies but rather by roping all the signatories under one umbrella of corporate governance. And although the federal regulators are often criticized for extremely lax enforcement of food safety standards, according to the Institute for Agriculture and Trade Policy’s 2014 analysis, the draft reflected the industry’s longstanding demand “to replace verification of food safety management performance by port of entry inspection of products with export food facility certification, by governments or third parties.” Translation: The deal could allow exporters to circumvent national inspection procedures with a pre-verified rubber stamp from an outside authority. Various proposals for deregulating safety oversight would also relax restrictions designed to keep out diseased meat and plants. Public health could face more direct attacks through pharmaceutical-industry giveaways. Draft proposals included measures facilitating the export of medicines without having to pass through additional reviews specific to domestic markets. In the more shadowy areas of global commerce, as debates around privacy and surveillance percolated in the political arena, the US tech-business lobby and National Security Agency both pressed for policies to minimize regulations related to information privacy. The US Council for International Business warned trade ministers against excessive protections for privacy and security that they characterized as “trade barriers,” essentially insinuating that some privacy protections existed merely to encumber the free flow of commerce. The TTIP negotiators also discussed proposals to roll back financial rules enacted in the aftermath of the recession, potentially loosening restrictions on banks’ investment activities in the Dodd-Frank Act. And to preempt future civil-society opposition to “trade promotion” policies, the giant agreement would be enforced through the notorious quasi-governmental investor-state dispute tribunals that had been used in the past to allow companies to sue governments to bypass or undermine various regulations. As the trade proposals were exposed through leaks via civil-society groups, grassroots organizing across consumer, labor, and environmental groups created massive public resistance through protests and public-education campaigns and eventually squelched the deal. fundamental symbol of how a whole economy has been geared up to…making corporate profits above everything else. And the so called rights of corporations to go wherever they want and do what they want and invest however they want…. I think TTIP was simply a symbol of that that appeared at the right time. I wish that Brexit and the popular uprisings against TTIP and the TPP would send a message to policymakers that it’s time for a new model for global economic integration that puts workers, communities and the environment first.… It’s going to require continued struggle before our movements see positive changes. Post-TTIP, activists can look ahead to next steps in playing both offense and defense on free trade: In the immediate term, this involves resisting future trade deals, such as another pending trade deal between Canada and the European Union. However, the long term challenge will be moving beyond merely resisting bad deals and toward constructing a new deal for civil society: an alternative plan for economic globalization prioritizing human rights, equitable development, health, and environmental protection—developing alternative systems of industrial production, and strengthening democratic civil-society institutions. The TTIP collapsed because it arrived at just the right time to spark public outrage; but real victory will come when society realizes there will never, ever be a right moment to put profits above people. Editor’s note: This article has been updated to reflect recent reports on the nature of the ongoing Transatlantic trade talks. 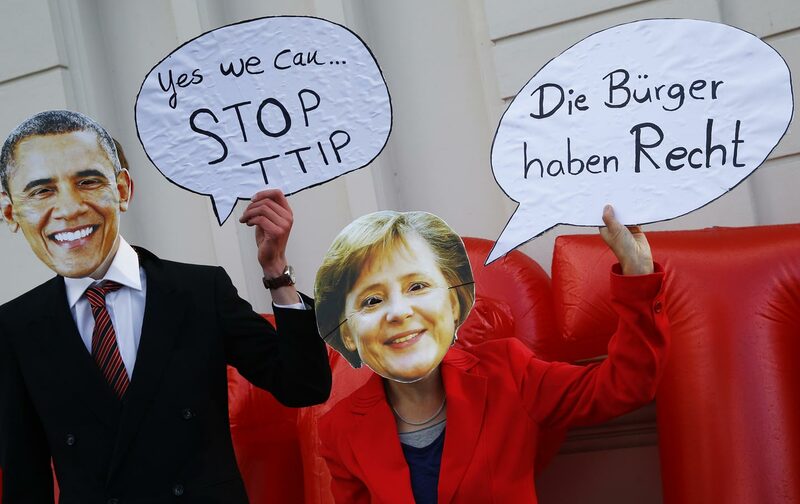 Since this article was published, tens of thousands of people came out to protest TTIP in several cities across Germany, on September 17.